Balgo, previously Balgo Hills and Balgo Mission, is a small community in Western Australia that is linked with both the Great Sandy Desert and the Tanami Desert. The community is in the Shire of Halls Creek, off the Tanami Road (formerly known as the Tanami Track). It has a petrol station, supermarket, Catholic parish, Luurnpa Catholic School (K–10), Adult Education Centre, clinic and police station. 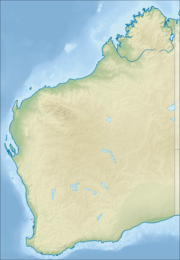 At the 2006 census, Balgo had a population of 460. It is possible that the name Balgo is related to the Kukatja language word palkurr-palkurr, meaning rice grass, which grows on the hills at Old Mission, a former site of the community. Kukatja is the first language for many people at Balgo. Luurnpa Catholic School has published a comprehensive Kukatja dictionary, based on the work of several linguists. The school includes the Walkala Centre where audio books are written, recorded onto CD or DVD in both Kukatja and English, and illustrated. The community was established following the arrival of German Pallottine Catholic missionaries in the region in 1939. Following the outbreak of World War II, the Australian government designated the missionaries "enemy aliens" and their radio transmitter and firearms were confiscated by police. After earlier sites proved to be unsatisfactory, the present site was chosen, in 1942. During the 1980s, Balgo became famous for its artists' cooperative which was established when some of the original members of the Papunya Tula movement were allowed to leave Papunya. Some of the artists from Balgo include Susie Bootja Bootja Napaltjarri, Topsy Gibson Napaljarri, Eubena Nampitjin, Elizabeth Nyumi, Boxer Milner, Tjumpo Tjapanangka and Helicopter Tjungurrayi. The community is managed by Wirrimanu Aboriginal Corporation, which was incorporated on 6 September 1984 under the Aboriginal Councils and Associations Act (1976). Balgo falls within the Determined Tjurabalan People (WC95/74) native title claim area. The town plan, Balgo Layout Plan No. 3, was prepared in accordance with State Planning Policy 3.2 and was endorsed by the community and the Western Australian Planning Commission in 2005. ^ a b Australian Bureau of Statistics (25 October 2007). "Balgo (L) (Urban Centre/Locality)". 2006 Census QuickStats. Retrieved 26 June 2011. ^ D. Choules Edinger and G. Marsh, "Reassessing the missions: Balgo – its history and contributions" (PDF), Kimberley Society, 3 November 2004. ^ "Full list of artists". Warlayirti Artists. Retrieved 10 September 2009. ^ "Balgo Layout Plan No.3". Perth, Western Australia: Western Australian Planning Commission. 4 October 2005. Retrieved 26 July 2012. Wikimedia Commons has media related to Arte contemporaneo australiano de Balgo Hills.